How big is Germany compared to the United States? In Which Country Was The Nazi Party Founded? Is East Germany a Country? Is Texas Bigger Than Germany? Was Germany Responsible For World War II? What are the popular places to visit in Hamburg, Germany? What are the Visa Requirements for German Citizens? 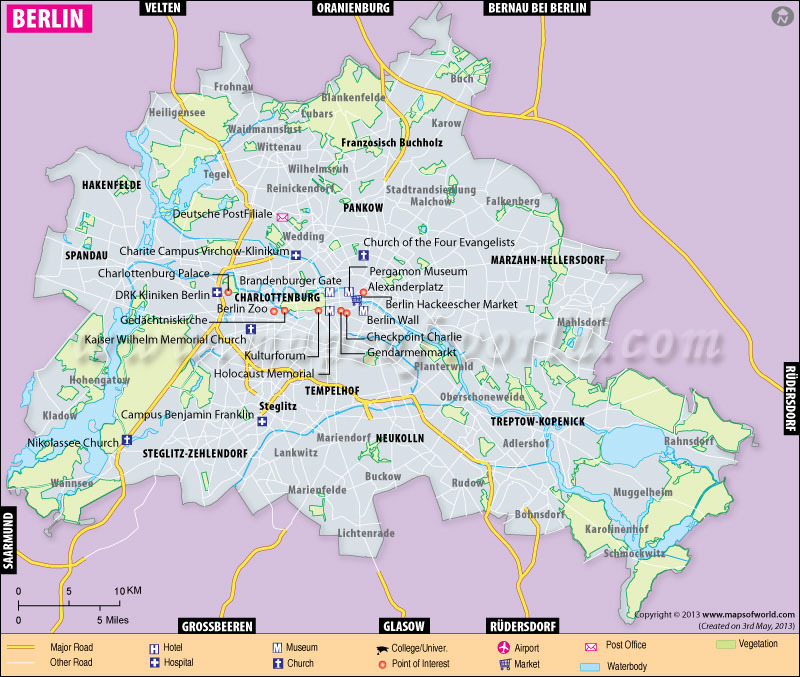 Explore Berlin Map, the capital city of Germany is a significant center of Europe. It houses prominent universities, research faculties, theatres and museums of the country. Berlin, the capital of Germany (German: Deutschland), is one of the 16 states of the country. It has an approximate population of 3.5 million. The city is noted for its historical associations, internationalism, lively nightlife, and historic interests. Though most of the architectural splendors of this city have been ruined over the years, they have carved a niche for their panoramic views. Today, the city houses famous universities, orchestras, research institutes, as well as various sporting events. With royal legacy and urban setting, the city is also known for its festivals, contemporary arts, and high living. Located in the eastern region of Germany, about 60 km from west of the Polish border, Berlin is basically noted for its low-lying marshy woodlands. It forms an integral part of the expansive Northern European Plain. The city enjoys a humid continental climate, where summers are warm and humid, winters relatively cold, and spring and autumn range from chilly to mild. By Air : Air travel to this city is not only the quickest mode of transportation, but also the cheapest mode of traveling. Berlin's airports – Schönefeld and Tegel – can be seen from the city’s center and are easily accessible. The airways are well-connected with the international and national routes. The popular airlines that run to and fro from Berlin’s airports include easyJet, Air Berlin, and Deutsche Lufthansa. By Boat : It’s true that many don’t consider this to be a favorable option, but then passengers from the ports on the German coast consider this to be the most convenient mode of travel. Besides that, visitors from Northern Europe and Scandinavia also favor the waterways. By Car : Traveling by car is indeed a favorable option as Berlin is home to great motorways. You’ll find several big streets that are connected straight to the city’s center. By Train : You may reach this city from various directions via trains like InterCity Express, InterRegio Trains, and EuroCity. Berlin Hauptbahnhof was inaugurated much later in 2006 and is located at the heart of the city. Summer is the most favorable time to visit as winters are extremely chilled and snowy. The peak season is from June to August, hence those who don’t like to visit places when crowded or don’t want to spend too much on their vacation should avoid this time. Rather, they should plan their tour during the'shoulder season' that lasts from March to May and September to mid October. Berliner Filmfestspiele : The Berlinale is a famous German film festival, which is attended by both Germans and Hollywood starlets. It is said to be one of the world's big three film festivals besides Venice and Cannes. Internationale Funkausstellung (IFA) : When it comes to talking about entertainment technology, Internationale Funkausstellung surpasses all. High-tech toys both for young and old are displayed in this age-old exhibition. It is one of leading trade shows for consumer electronics in the world. Popkomm : A popular music festival, it lures millions of music fans every year. It is noted for its musical concerts and talks. Christopher-Street-Parade : This parade is noted for celebrating alternative lifestyles. On this event, you’ll find gays and lesbians boisterously dancing, drinking, and celebrating on the Central Berlin streets. Berliner Festspiele : It is home to various theatrical performances, exhibitions, classical concerts, jazz, and literature, all arranged around a specific theme. Grüne Woche : It is the biggest gourmet feast across the globe where you get to explore thousands of culinary delicacies under a single roof. Internationale Tourismusbörse (ITB): It is the biggest tourism fair of the world where you’ll find various ornately designed stalls. Brandenburg Gate : An important landmark of Germany. Reichstag : Renovated from what it was in the former days, today Reichstag gives a crystal clear picture of the city life. All you need to do is climb the building’s glass dome and get the picturesque view. Berlin Television Tower : Fernsehturm, as it is popularly known among the locals, is the tallest building in the city. It was established in the 1960s and lies close to Alexanderplatz. Gendarmenmarkt : Located near Friedrichstraße, it is one among the most striking squares in Berlin. The square is home to three architectural wonders; namely, the Concert House and the French and German Cathedrals. Charlottenburg Palace : The beautiful palace is located just out of the city center and was established around 1700. Prussian Elector Friedrich III had appointed people to build this park in order to show love for his wife, Sophie Charlotte. Museum Island : One of UNESCO's world heritage sites, the Museum Island in Berlin is home to some of best exhibition centers including the Neues Museum, the Altes Museum, the Pergamon Museum, the Bode Museum, and the Alte Nationalgalerie. Berlin Wall : It is referred to as a barrier, which was built by the GDR (German Democratic Republic). Constructed on August13, 1961, this barrier had cut off West Berlin completely from East Berlin and surrounding East Germany. Similar to other destinations, when in Berlin, you need to look for comfortable stay options in order to enjoy your vacation thoroughly. If you don’t mind being a bit extravagant on your vacation, then options like Regent Berlin, Hotel Concorde Berlin, Pullman Berlin Schweizerhof, and the Mandala Hotel will work well. On the other hand, if you are looking for budget options, then you can plan your stay at accommodations like the Circus Hotel, H2 Hotel Berlin Alexanderplatz, Ibis Berlin Mitte, and the Holiday Inn Express, Berlin City Center.